With the benefit of advanced analytics such as online analytical processing (OLAP), data mining, and text analytics, the IBM® InfoSphere® Warehouse Enterprise Edition brings sophisticated business intelligence (BI) to warehouse users. InfoSphere Warehouse allows you to run extreme concurrent query volumes that can help answer questions for all types of business users, while consistently meeting service level requirements. Combined with a virtualization platform and a solid BI solution, such as IBM Cognos®, you can deliver BI cloud services with improved flexibility and speed to your clients, thereby presenting a new avenue for which your services can be offered. 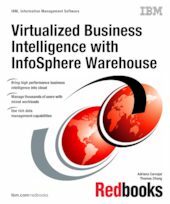 This IBM Redbooks® publication discusses the deployment of a BI cloud solution. It includes details such as understanding the architecture of a cloud, planning implementation, integrating various software components, and understanding the preferred practices of running a cloud deployment. Essentially, this book can be used as a guide by anyone who is interested in deploying a virtualized environment for a BI cloud solution.